Hawaii is one of the world's premier travel destinations. However, if visitors look beyond the views of Diamond Head, Waikiki Beach, palm trees and the blue Pacific, they'll see a renewable energy transformation under way that could be a model for others around the world, RenewableEnergyWorld.com reported last week. 90% of Hawaii's energy for transportation and electricity comes from fossil fuel, making it the highest in the US. This cannot go on forever with the depleting oil reserve and the ever increasing cost of obtaining such energy source. Caring for nature and concern for emission of carbon, Hawaii took several measures in adopting green energy source such as using biofuels to generate power, encouraging the use of electric vehicles, drilling for more geothermal energy, and integrating more solar and wind power. Latest in its list of initiatives is the testing of the smart-grid by Hawaiian Electric Company, HECO together with its subsidiaries. In 2010, the Solar Electric Power Association ranked HECO third in the United States for growth in solar power. According to RenewableEnergyWorld, Hawaii has more solar watts per customer than all but a few U.S. states. 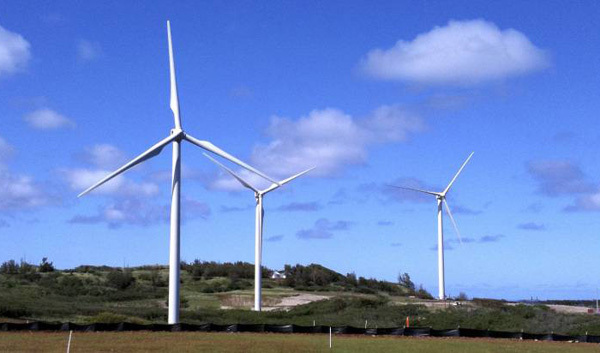 Wind farms provide power on our three largest islands and additional projects are in the pipeline.According to Clean Technica, Hawaii is currently developing its 69MW Kawailoa wind power project, dubbed the largest in the tourist island on Oahu’s North Shore. The wind power installations consists of 30 nos of 2.3MW Siemens wind turbines, enough to power approximately 14,500 homes on Oahu Island. This makes about 5% of the island’s total power demand. Another renewable energy source - geothermal energy - provides about 17% of the electricity on Hawaii island. Collaboration between authority and the local communities, and renewable energy developers also helps in shaping the future of the island's geothermal development. Common sense tells us that if clean energy technology can be made to work on the small independent grids in Hawaii, it can work anywhere. Solutions developed and tested in Hawaii is said to feature the most advanced technology. It will be constructed in ways that are environmentally friendly. Hawaii encourages the use of Electric Vehicle developing 'discounted overnight charging rates', and the government is working with electric vehicle manufacturers and service equipment suppliers to ease broader adoption of such vehicles there. Let's hope that Malaysia could make similar effort to encourage the use of more electric vehicles, such as lowering the cost or owning the New Toyota Prius and the Honda Insight. Di Pulau Banggi pun dorang bilang kuat juga. Di Pulau Perhentian (Terengganu) ada wind mills tapi skala kecil jak. @tehr. Mesti ada tu, especially East Coast of Peninsula and North of Sabah.